Their ideas of what online schooling and computer gaming would look like were especially depressing! And the depiction of women… That’s an interesting topic for some conversations. Here’s a fun little math trick with a cool story behind it. 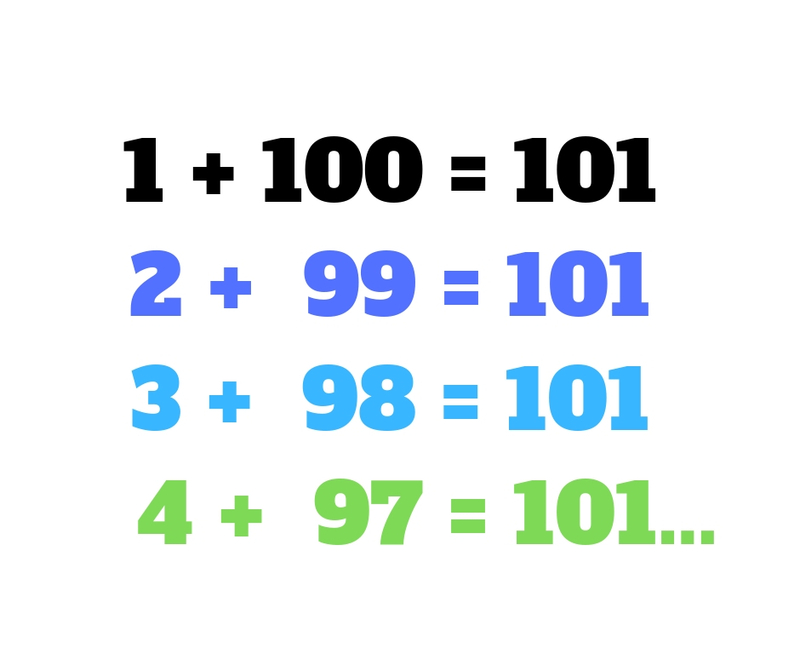 Ask the kids if they can figure out the sum of all the whole numbers between 1 and 100. Then tell them about a kid who was able to figure it out in just a few seconds. He was also a child prodigy. When Carl was 9 or 10 years old in Germany, his teacher gave the class the assignment to add all the whole numbers from 1 to 100 (1+2+3+4+5 and so on) in order to keep them busy. Carl did the problem in his head almost immediately. He wrote the answer on his slate, turned it in and sat down with his hands folded on his lap while (it is said) he teacher looked at him scornfully. When the teacher checked the stack of slates later, Carl was the only one to have the correct answer: 5050. Carl realized that he could add the numbers in pairs: 1+100, 2+99, 3+98, etc. and that every one of them added up to 101. He then simply multiplied 50 (the number of pairs of numbers he was adding) times 101 (the answer to every pair he added) to get 5050. Daryl told me years ago that he read in a novel that September was “the month of winds and magic.” That has always stuck with me and while I kind of hate September for signalling the end of summer, I kind of love September for a hundred other reasons. We’ve been super busy with homesteading this month, as always. September is a month where lots of garden goodies are ready to harvest and when we forage large amounts of some of our favorite wild foods like acorns and elderberries. It’s also when we forage less than wild foods like apples and pears that are free for the picking, literally. We have friends and neighbors who let us pick from their trees (we keep the ground underneath clean and often bring them goodies in thanks) and there are a lot of public places where we pick, too. The nursing home in town has a huge pear tree that bears delicious fruit that they want no business with and also has a row of elderberry shrubs that are only there for a windbreak. Daryl has permission to go picking there and we get gallons of elderberries and bushels of pears every year. There’s also a pear tree at a rural park that bears delicious canning pears (too firm for fresh eating but perfect for canning). You can always tell where homesteads were years ago because even though there is no sign of a house anymore you will find apple trees, pear trees, peonies and other long-lived plants that once blessed the people who lived there. We’ve also been busy with Daryl’s birthday and our wedding anniversary. As I’ve talked about before, we get married in a different way every year around our anniversary and this year we had our first back yard wedding. We made it a zany theme with lots of color and silliness. It was simple and fun. And in other news, Jack (15) has his first job! He was hired by a local farm family to help with the harvest. He was originally hired to work 4-6 hours a day during the day just until the end of harvest season in October. Then we found out that homeschoolers under 16 are not allowed to work during public school hours even if they homeschool during other times and they’re not allowed to work more than 3 hours on a public school day, so we’ve had to change his schedule around. He now works 3 hours “after school” most weekdays and longer on Saturdays. The weather is turning cold and I’m doing my best to embrace it and not yearn for lake days and sprinkler weather. Snow will be coming way too soon here in Minnesota but for the most part we’re too busy to focus on that anyway. The rest of September and October will be very hectic. I’m giving an acorn foraging presentation at a library by the Twin Cities in early October, then we have Fiona’s birthday and the week of History Fest, which is a crazy but wonderful time. And then there’s processing hundreds of more pints and quarts of applesauce, pears, spaghetti sauce, salsa, and so on. Oh yeah, and this homeschooling business. 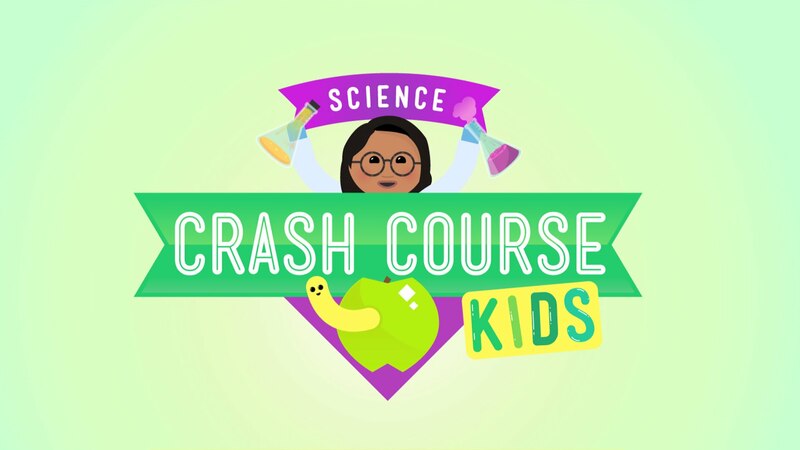 I’ve been a long-time fan of Crash Courses for older kids, but we hadn’t used the newer version for younger kids yet, Crash Course Kids. Fiona, Alex and I checked it out last week and we’re going to incorporate it into our video watching. The series is designed for 5th grade but Fiona (starting 1st grade) easily comprehended everything so far and it still kept Alex’s attention fine (6th grade). We’ll supplement with good books, art projects, and hands-on learning. This won’t be the younger kids’ sole science curriculum, of course, just a fun way to add some extra stuff in. Fiona is loosely doing first grade this year (and some second grade). 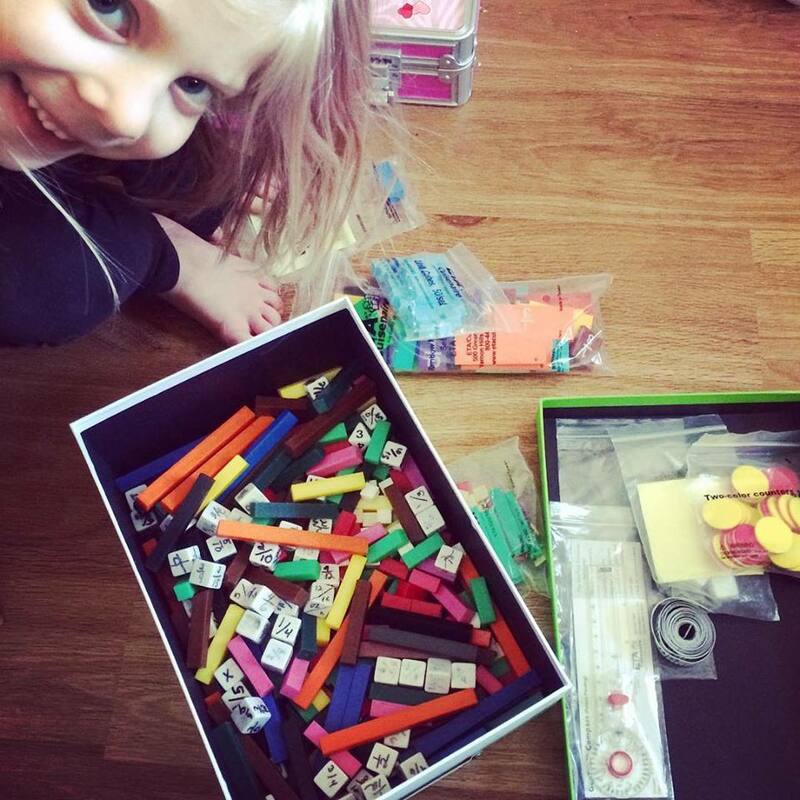 You know we don’t strictly follow any skills lists or curricula, but I like to keep track of what kids her age would be covering in school and find ways to playfully teach those concepts through hands-on activities like using Cuisenaire rods, playing games, playing with math tools, measuring and making things, and so on. I plan to play with all of these concepts in the following months, and to make up some fun worksheets to reinforce the concepts. I don’t generally print out worksheets and instead I write out problems myself in my kids’ homeschool notebooks. It allows them to be more personal (I’ll often write out silly word problems or have sweet or funny copywork that is tailored to them, for instance), saves ink and cost, and makes it more fun for them. Since she already knows much of this, we’ll have some fun reinforcing it and be sure to have it all down pat and then I’ll probably move on to the second grade set around Christmas time. There is NO RUSH on any of it. As with all of the kids, it will all be about keeping pace with her interest and skills. If you want to find other grades, they have similar resources for all grades K-6. Last night was the final performance of the year for the Laura Ingalls Wilder “Fragments of a Dream” pageant in Walnut Grove, and it marked the 15th year our family has acted in the outdoor play. Long-time readers might remember that Victoria and Rhia (then known as Annalee) started in the pageant at ages 6 and 4, all those years ago. Daryl joined the next year, playing Reverend Alden. The girls were in it for about 10 years each and Daryl has acted in it every year since. Eventually they were joined by Jack and later Alex, and Fiona started acting in it 3 years ago at age 3. This year’s pageant was quite the drama. We experienced a “hundred year flood” the week of opening night that completely washed out a road and put the entire pageant set under water. Here’s the road leading to the pageant site, or what was left of it after the rushing water in the drainage culvert under the highway literally blew it out from under the road and destroyed the road completely. Some of the crew even took a row boat to rescue the calf (“Spot”) from the set. We didn’t know if we’d be able to have a show at all, or even if the set could be saved, but the cast and crew came together, cleaned everything up and fixed it all, and scheduled 3 shows a week for the next two weeks to make up for the missed first shows. It was a grand, exciting, exhausting, worrisome, wonderful season that showed how hard work and a team effort can make anything happen. The cast and crew worked tirelessly and once again put on a really incredible performance night after night. My kids are sad that it’s over. They’ll miss their pageant friends (some of whom travel from as much as 3 hours away and camp or stay with relatives in order to take part as a family!) and the acting, singing, dancing and play with their fellow cast mates. I’m trying once again to get back to regular blogging after so many false starts, so I thought I’d just dive in with a quick post for anybody who’s still out there. 1. Our rescue kitten, Oscar. Long time readers know that we’ve found homes for many feral kittens and cats over the years but we decided we were down to a manageable enough number of pets again (3 cats) that we could adopt one ourselves. 2. Silly car games on car rides. This one that Rhia made up to occupy Fiona and Alex had us all in stitches. 4. Foraging as a family. As always, we’re gathering loads of wild edible foods so far this season. It always makes me smile to think that this all started as a fun summer homeschool project and it’s evolved into something that provides hundreds of pounds of free, healthy food for our family (and two books!). So far this year, we’ve gathered over 60 pounds of wild asparagus and various quantities of morel mushrooms, lambsquarters, pheasant back mushrooms, nettles, ramps, violets, wild onions, and more. 5. Membership to the science museum. We’ve been getting lots of use out of our annual membership, even though it’s an hour and a half away in Sioux Falls. We do much of our shopping in Sioux Falls and Rhia’s boyfriend lives there, so we have lots of excuses to go lately. I always try to combine educational benefits and fun for the kids in our travels even to nearby cities, so we tend to go as a family and make an adventure of the day. There is a lot of other stuff going on (mostly good, some less so) and I hope to start catching up on all of it. What are you and your kiddos up to this month?